HOW FAR COULD FERAL EUROPEAN BUMBLEBEES SPREAD IN AUSTRALIA? -- Have you seen a bumblebee on the Australian mainland? -- What harm could feral bumblebees cause? The Australian Hydroponic and Greenhouse Association (AHGA) commissioned a CLIMEX study by Dr Alec McClay to see how far the bumblebees could spread in Australia. 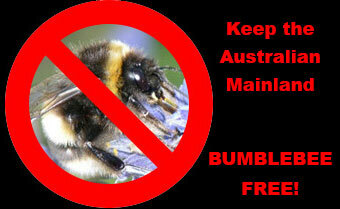 This was part of their 2006 application to import exotic bumblebees to mainland Australia. Fortunately the AHGA proposal was rejected by the Federal Government in 2008. However, Dr McClay's findings still give important warnings about what could happen if bumblebees were ever brought onto mainland Australia. Dr McClay produced two different distribution maps showing how far bumblebees could spread in Australia if they escaped into the bushland and became feral. Which would be the ultimate distribution of feral bumblebees in Australia? The Smaller Distribution on the Left? This is the distribution map that the AHGA chose to adopt in their importation proposal (AHGA report, pp iv, 43). It shows the predicted spread of the British Isles bumblebee subspecies, Bombus terrestris audax, in Australia. CLIMEX study author, Dr McClay, said this distribution is based on the unproven assumption that B. t. audax is an 'extreme climatic specialist' (AHGA report, pg 88). However, Dr McClay said this 'should be considered as an absolute minimum estimate of the potential range of this subspecies in Australia' (AHGA report, pg 88). Or The Larger Distribution on the Right? This map shows the predicted spread of the main bumblebee species, Bombus terrestris, in Australia. CLIMEX study author, Dr McClay, said, 'It should be expected that B. terrestris audax would be able to establish in broader areas of Australia, possibly approaching the limits predicted [in this larger distribution]' (AHGA report, pg 88). The AHGA rejected this larger distribution, saying that bumblebees will not spread into warmer areas because of their diapause needs. Their argument was largely based on research by Dr Madeleine Beekman (University of Sydney) but Dr Beekman disputed their interpretation of her results. Why Did Dr Beekman Dispute the AHGA Diapause Argument? Bumblebees usually survive freezing cold winter conditions in their native countries by going into a hibernation state called diapause. The AHGA argued that this diapause behaviour might limit the northern spread of feral bumblebees in Australia. -- AHGA Claim -- B. terrestris audax bumblebee queens must go through diapause before they can produce eggs and viable colonies. -- AHGA Claim -- This required period of diapause involves spending a considerable period of time at temperatures between zero and five degrees Celsius. -- AHGA Claim -- Research by Dr Beekman shows that, without diapause, queens produce substandard colonies that would become seriously weakened and die out. -- AHGA Conclusion -- Therefore, these bumblebees will be unable to survive in warmer areas of Australia. -- The AHGA is misinterpreting Dr Beekman's research. -- Bumblebees do not necessarily have to go through diapause before breeding. Dr Beekman points out that there are several accounts of bumblebee queens producing new colonies without going through diapause (Tasei 1994, Buttermore 1997, Beekman et al. 1999, Beekman & van Stratum 2000). -- Furthermore, bumblebees can both enter and leave diapause at warm temperatures. -- Dr Beekman actually bred four lines of bumblebees that were able to produce colonies without going through diapause. She said these colonies were certainly not substandard but in fact produced more queens and males than the colonies headed by 'normal' queens. -- Dr Beekman concluded that she has no reason to believe that the spread of feral bumblebees would be restricted in the way that the AHGA claims. Why Did the CLIMEX Study Author Think the Smaller Distribution is Unrealistic? The author of the CLIMEX study, Dr McClay, said, 'this model is not intended as a realistic interpretation of the climatic requirements of B. terrestris ssp. audax...' (AHGA report, pg 93). He said this subspecies is mainly restricted to the British Isles by the North Sea and the English Channel, not by climate. So there is no direct evidence to prove that this species can only survive in places where the climate is similar to the British Isles. Dr McClay concluded that this smaller distribution 'represents an absolute minimum predicted range for this subspecies in Australia' (AHGA report, pg 95). Sadly, if feral bumblebees do become established on mainland Australia, their range will probably approach the larger distribution shown in the right hand map. Within this massive distribution, feral bumblebees would have the opportunity to cause a great deal of harm, impacting our flora and fauna and spreading agricultural weeds. Proposal to Import Bombus terrestris (Bt) onto Mainland Australia for Crop Pollination Purposes. Beekman, M., and van Stratum, P. (2000). Does the diapause experience of bumblebee queens Bombus terrestris affect colony characteristics? Ecological Entomology 25, 1-6. Beekman, M., van Stratum, P., and Lingeman, R. (1998). Diapause survival and post-diapause performance in bumblebee queens (Bombus terrestris). Entomologia Experimentalis et Applicata 89, 207-214. Beekman, M., van Stratum, P., and Veerman, A. (1999). Selection for non-diapause in the bumblebee Bombus terrestris, with notes on the effect of inbreeding. Entomologia Experimentalis et Applicata 93, 69-75. Buttermore, R. E. (1997). Observations of successful Bombus terrestris (L.) (Hymenoptera: Apidae) colonies in southern Tasmania. Australian Journal of Entomology 36, 251-254. Tasei, J. N. (1994). Effect of different narcosis procedures on initiating oviposition of prediapausing Bombus terrestris queens. Entomologia Experimentalis et Applicata 72, 273-279. What Harm could Exotic Bumblebees cause?